I am not going to begin this story at the beginning. That would be the easy thing, and stories are not easy. Love is supposed to be easy. You fall into it, and what could be easier than to fall? Our early lives are written in skinned knees and scraped palms. We trip, we tumble, we fall. Easy. Falling, though, doesn’t guarantee someone will be there to catch you, and love, unlike falling, is not an activity that happens on its own. I have only ever wanted to be loved. But I am not going to begin this story at the beginning, not going to walk you through a litany of failed relationships. That could be anyone’s story. At least that’s what I tell myself — that everyone fails at love. I am not here to tell you anyone’s story. I am here to tell you mine. So I am going to begin with the day that I pulled my heart from my chest, to look inside it and see my future. To see, finally, who it was who would love me. Well, perhaps I won’t begin there. There is a bit more to the story than that. Perhaps I need to begin a little bit earlier, so I can show you how to take the auspices, to read the signs. So you know what you are looking for. The color of your heart, when you hold it in your hand, is Tyrian purple. That is the name for the purple that is at once red and blue, and both together. You can still see the individual colors, even though they are combined. It is so elegant, really, just like love. Two things, still recognizably separate, combined to make a new, beautiful whole. There is a lot to be seen in a heart, if you know how to look. If all you’re trying to do is predict the future, there are any number of things you can try. Choose your favorite Tarot deck — you’ve probably seen a version of the Rider–Waite somewhere, though I’m an old–fashioned girl, I like the Visconti–Sforza, myself — and query it. Ask your questions honestly, and you’ll get an honest answer. Beware the hanged man. Or dangle a pendulum, and let it swing to yes or no for you. Brew tea, and let the leaves left in the bottom of your mug form pictures for you to read. Tasseomancy. Such a beautiful word. It includes divination by wine sediment, or by coffee grounds, as well. Theriomancy includes all divinations using animal behavior. Umbromancy reads the future in shadows. So many ways to get answers to all of your questions about what will happen. It’s possible to sit in your room and, if you ask the right questions, know almost anything about how your life will go. Imagine that: knowing your beginning and your end, and not even needing to step outside your door. Sitting in the room where you are now, and knowing how you will die. I chose somatomancy: divination by the body. Sometimes it is best, when seeking answers, to look inside yourself. It’s not like open–heart surgery. There’s no anaesthesia. No sterile tools, no gloved hands. Let’s be serious here: what I am doing, what I have done, it’s not science. He smiled, because he envisioned himself as one of them. I laughed, because I knew there would be others after him. The problem with chiromancy, though, is while it can speak in generalities like that — lots of lovers, a long life — it lacks in specifics. You will have many lovers is all well and good, but that line on my hand doesn’t tell me their names. It doesn’t say which will be a drunken regret, or about the scruff of a man’s beard, or the softness of a woman’s thigh, or the particular pleasures each can bring. It doesn’t say how long we will be together, or why things will end. It doesn’t tell me that all of them, all those many lovers, eventually, will leave me. I want someone who will stay. Haruspicy is the method of divination where the future is read in the entrails of a sacrificed animal. The most common organ used, after the viscera generally, is the liver. There’s even a specific name for it: hepatomancy. The inside of my liver, or my bowels, was really of no interest to me, and besides, divination works best when there’s a strong connection between the question that is asked and the desired answer. I wanted to know the future of my heart. Best to ask that organ directly. I didn’t set out to become my own haruspex, of course. It’s the sort of thing you lead up to. You know, like first you think you’ll meet someone at school, and then you think you’ll meet someone at work. Then you let your friends set you up on blind dates. Then you try online dating, and not just on the nice sites, the ones with safety measures. Like that. I started with driromancy. Divination done by reading the shapes made by puddles of dripping blood. I should have better divined the auspices. What was begun in blood — mine, pooling on a plate, making shapes and telling secrets, writing his name in curves of red — was ended in blood as well. Mine again, blood that refused to come on its appointed calendar day. He fled before that absence, an absence that, to him, meant an unacceptable fate. There was more blood then, to tell the lack of a future. Driromancy didn’t work. I needed a better method. Auspices. Now it’s a catch–all term, used for looking at any kind of prophetic sign. But it used to be a specific one, for a reading of the birds. Their flight patterns, divined by an augur, a method of divination old enough to be mentioned in the Iliad: Calchas, the auspice to Agamemnon. Two–selved Tiresias invented the reading of the auspices. I imagine it to be a very beautiful form of divination, all feathers and wings. But soon after, haruspicy, divination in the blood and the guts, gained more prestige. Beauty isn’t everything. Next, I tried osteomancy. It is a form of sortilege — cast the lots, roll the bones. I used my bones, of course, ones chosen specifically for this purpose. There are 206 bones in the human body. One, here or there, taken out and put to some use other than the holding up of flesh, is hardly remarkable. Some bones come out more easily than others. No, I will not tell you which ones. If you were to see me, you might perhaps divine that answer from the scars on my skin. Perhaps not. Every omen requires interpretation. Omens are like stories in that. I liked holding my bones in my hand, liked the clicking rattle they made when I shook them together. I loved the patterns in the spill when I scattered them out, looking for an answer to my question. Always the same question: who will love me? She did, for a time, and I told our future on her bones, the braille of her spine and the ladder of her ribs. I read what was there written with my hands and tongue. At the end of it, though, everyone’s bones tell the same future. They press closer and closer beneath the surface, until you see the skull beneath the skin. Until you just see the skull. Maybe the bones had spoken truly. Maybe she had loved me. Maybe she would have stayed. But her bones betrayed her, and she, like all the others, left. You have to be yourself to find love. Your true, authentic self. You can’t hide. The metaphor is more than just being naked. (Which is difficult enough. Imagine the dance of dimmed lights and artfully draped clothing and just leaving your bra on that you do with a new lover. You move so carefully, showing only the best parts, the most attractive angles.) The metaphor is cutting yourself open, is peeling your skin back. It is letting someone else read your entrails. It is handing your lover your still–beating heart. Just be yourself. There is someone out there who will love you. I have always been myself. I have only ever wanted to be loved. So I decided I would look into my own heart. Be as stripped down, as naked, as honest as I could be. Risk everything. Here I am, then. Back at the beginning of my story. You remember: The day I pulled my heart from my chest so I could read my future in it. Tyrian purple. Easy as a fall. Inside, my heart was full of names. I had done something wrong, was reading incorrectly — from the shock, maybe, or the pain — because I recognized them all. A palm’s worth of prior lovers. All names I already knew. I was not looking for the past, but for the future. So I looked closer, dug my fingers into my flesh, divined each chamber. There would be another name. Someone who would truly love me. Someone who would stay. I thrust my unsatisfactory heart back into my chest. Blood dripped from my fingers to puddle on the floor. A small chip of bone fell. Haruspicy, osteomancy, driromancy. No answers. No fate. It wasn’t surgery, but I can show you my scar. My future, written here on my chest. The palmist told me I would have many lovers, and I have. I have. Divination is a subtle art. So many things matter: the type of divination practiced, the question asked, the materials consulted. I know the proper materials now. I divine their hearts, still beating, a devout haruspex. I know that one day, I will read my name in someone else’s heart, and that is the heart that I will return to beating. Safe in its blood, safe in its bone. A body I can interpret like an omen. And then, finally, I will fall. Kat Howard is a World Fantasy Award nominated writer whose work has previously appeared in Apex Magazine, as well as Lightspeed, and Subterranean. 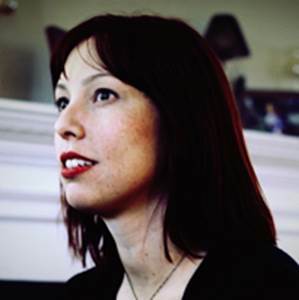 Most recently, she has co–written a novella with Maria Dahvana Headley that will be published in 2014 by Subterranean Press. You can find her on Twitter at @KatWithSword, or on the web at strangeink.blogspot.com. Gahhh. I want to write fanfic of this where an intrepid posse of friends is trying to figure out how to fight a claw-fisted woman who keeps ripping out hearts before scrutinizing them, tossing them aside and howling. Utterly beautiful story… beautiful and heartbreaking. You know (if you are 30 or older, you probably do) how you used to think you were bizarre, a freak, an abomination, then someone invesnted the internet and you discovered there were thousands of people like you, and even subclasses within those, and you finally felt you belonged? I just had the same feeling. I’ve been a heart aruspex (a cardiomancer?) for years and finally met my kind. I meant haruspex, of course. A very deft piece, slippery, between horror and middle age angst, just the other side of sanity. After a few reads, I can’t really feel where it’s slipping between things. Great craft and great story. 🙂 Well done, Kat.